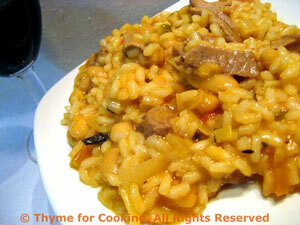 Risotto with Lamb and White Beans, Breton Style, quick and easy recipes. Before the last 1/2 cup taste a few kernels of rice. They should be just 'al dente' - slightly resistant to the tooth but fully cooked. While risotto is cooking, put all ingredients in a small skillet or saucepan. Gently heat through, cover and keep warm until needed for risotto.